I think I reached a new level of board game geek with my purchase of Forbidden Desert. It’s the first game I purchased in large part due to the fact that I was familiar with the designer’s previous work. Matt Leacock also created Pandemic, which is a wonderful cooperative play game that became a big hit with our fairly non-competitive group. 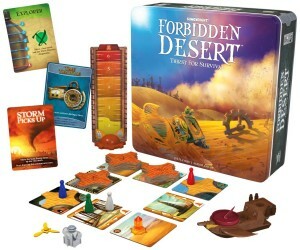 The fact that Forbidden Desert also offered cooperative play was the final selling point for me. Forbidden Desert (the full title is Forbidden Desert: Thirst For Survival and is put out by Gamewright) is a cooperative tile-based game for 2-5 players, aged 10 and up. It takes about 30-60 minutes depending on your skill level and familiarity with the game. While the game itself is fairly easy to learn, sporting a small six page rule book, it’s fairly difficult to master, which in my opinion is a great thing in a cooperative game. Across a windswept desert, your team of adventurers is hunting for a legendary flying ship from the past. But a deadly sand storm has crashed your helicopter and stranded you. Now, with your very lives on the line, you must scour the area to find the pieces of the flying ship, assemble it and escape the sand storm before you’re all swallowed up by the ever shifting desert. Each player takes on a random role (such as ‘Explorer’ or ‘Water Bearer’) and moves around a set of randomly arranged tiles that lie face down. These tiles, laid out in a 5 x 5 square, create a makeshift board. The players move their pieces from tile to tile and spend actions to do things like clearing sand, excavating and learning clues about where the hidden pieces of the ship are. But beware! Each turn, more storm cards get played, the storm moves, sand piles up, water resources grow scarce and the danger grows. It’s a race against time that forces players to work together to get the most of out their special abilities. If I had to use one word to describe Forbidden Desert, it would be ‘fun’. If I were allowed a second, it would be ‘challenging’. The first four times we played this game, we lost. The fifth time was so excruciatingly close, that when we finally did win we all actually cheered and high fived each other. This was while the game was actually set at the beginner level. Thankfully, even losing this game is a lot of fun and it leaves you wanting to play again rather than feeling dumb or incompetent (I’m looking at you Ricochet Robot). Its relatively short play time allows for a few play throughs at a sitting. The multiple roles and random tile layout guarantee a fresh gaming experience each time. Its $25 MSRP is also very reasonable and the pieces are fun and evocative. Each flying ship part is an actual 3D piece and the little ship can actually be assembled at the end. The square tin the game comes in is a bit gimmicky, but I can mostly forgive that. This game is a wonderful addition to any collection for folks who are looking for titles that are accessible to all levels of gamers, those who like cooperative titles, and for those who don’t want to invest an entire evening in a single game. I plan on heading back to the Forbidden Desert again soon. I want that second win.